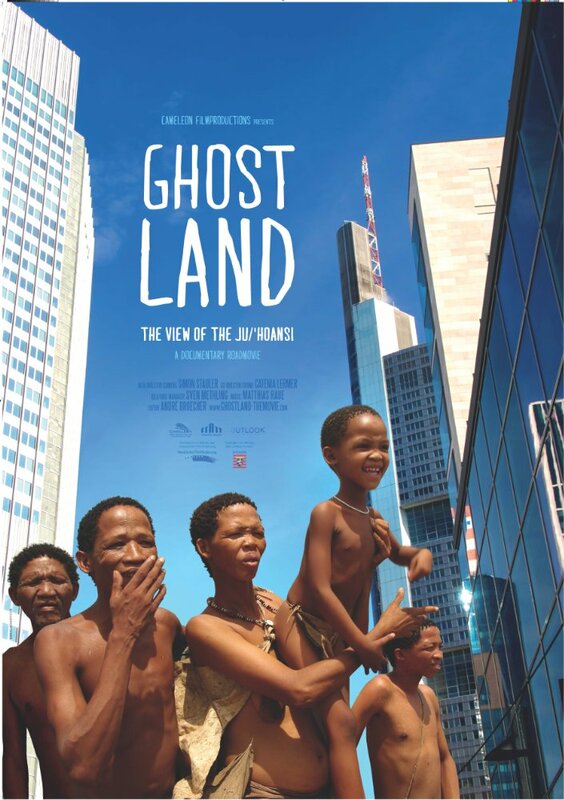 The opening title of the Ghostland: The View of the Ju’Hoansi reveals that since 1989 it’s forbidden for the Ju/`hoansi bushmen to hunt by law. After finding out that, their basic meat needs were met by eating Giraffes they would find in the solidarity of a new law. However, for the villagers, losing their basic needs, the oldest culture on our planet lasting for over 2,500 years – they do not try to survive in a new world with the rules that they had known nothing about. But soon, it’s their culture, their lifestyle and the vision of life which will be learnt by Europeans, where a significant amount of members of the tribe get a chance to travel abroad. Kxore, a member of the tribe discusses on the camera while she talks with her friends, recalls a time when they were hunting without worrying about the law. She shares how the old men would hunt after dinner to make through another day. But many years after the law, they can’t seem to find happiness in satisfying their hunger in a modest way. As you listen what the bushmen had to say, you will, and I am sure of that, find yourself amazed how less they need to cherish and share the happiness and joy they have. For the viewer who may find strange and impossible to survive and even to exist in such harsh human conditions, it’s the Ju/`hoansi bushmen who do not find a noisy and the beautiful life of the city so welcoming. Through the interviews you will find a wisdom of words that come out from the people who most of us would consider as uneducated. However, it’s them, who will appear more knowledgeable than any human wearing expensive clothes and with pockets full of money less educated. But the point of this film is not to find whose life is better, and who brings more value to the society – but about who brings the valuable things to the society by causing less harm and be happy as much as they can – and that is the Ju`/hoansi’s people. In conclusion, Simon Stadler’s Ghostland – the view of the Ju/’Hoansi brings a close-up look into the Ju/`hoansi’s 2,500-year-old culture in a way that would cause an envy in any of us. The filmmaker patiently follows the bushmen till Europe, where they introduce their culture and attend the workshops. Yes, they will have to put some clothes on, to be like like many other people. But despite the beauty of Germany and the possibilities that came their way, the idea of being close to the family, to take care of them despite living under the sun, the winners of this world are not those who ride a car, but the ones who ride on their own feet and has the best access to the Sun. This and many others aspects of Simon Stadler will make you appreciate his effort and fall in love with the most purest human beings you will ever get a chance to meet – the bushmen of the Ju/’Hoansi.